The webbing strap must come off the side of the tree/anchor and not in the center. This reduces the force on the clips and maintains their weight rating. The suspension must come off in a 30° angle from the tree/anchor. 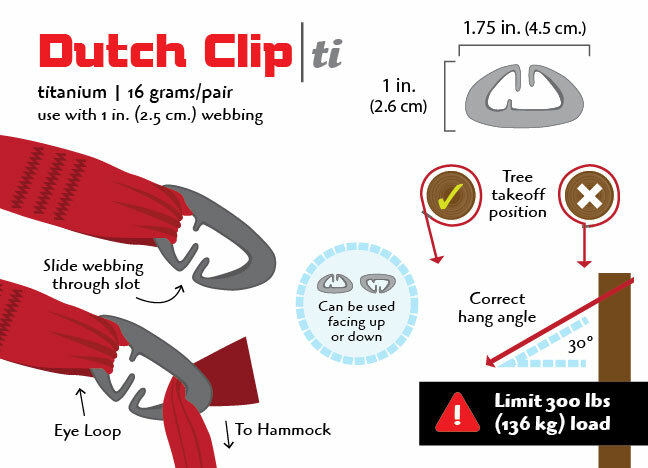 The Dutch Clips are not designed for hammocks with structural or integrated ridge lines and suspension systems where the suspension is pulled nearly taut across the anchor points. This puts too much strain on the clips and will easily exceed their weight rating. Dutch mentioned that he is working to get these items on his website within the next week. Doesn’t the “tree takeoff position” make it difficult to rig your tarp directly over the hammock? I can see this causing all sorts of problems staying dry with a small asym tarp. Yes, this is a tricky situation. At first, I didn’t know that the takeoff position for these clips was off to the side, as illustrated. Dutch let me know of this when I was helping with the illustration. Apparently Jacks “R” Better, who sells the majority of the aluminum Dutch Clips, did some stress testing and found that this position is best for the least amount of strain. Asym tarps are the worst affected. By following this illustration, you’d have the tarp follow the same wrapping direction as the clip. I don’t want to go against good advice, but I’ve been using my Dutch Clips close to center ever since I received them and the only issue I’ve seen is abrasion, especially with certain types of webbing. Heavy straps do great, but I had some brand-new yet thin straps get cut completely through on one hang. These new titanium Dutch Clips don’t appear to have that abrasion issue, thanks to the nice rounded inner corners. I’m going to ask Dutch about the working parameters with using the clip in the center to see what real issues and forces we’re dealing with. Clarification from Dutch indicates that the line will turn to center once loaded, so it isn’t a huge deal, but it is something to be aware of. So, do you think that these would work for a thru hike with standard 1″ poly tree straps? Or would they cut through after a couple of weeks? I’ve only used my set a few times so I can only speculate on the long-term durability. For durability questions I would contact DutchWare directly. In my own experience it looks like the clips “scrunch” the webbing sufficiently to reduce rubbing and abrasion. If it were me and I chose to bring the Dutch Clips | ti, I would put a spare set of straps in my bounce box just in case. What is the best way to get the end of the strap attached to the hammock? The “best” way is up to you 🙂 There are several “best” ways depending on what you prefer. Some people like climbing carabiners. They are easy to come by, strong, and simple to understand. Weight conscious hangers might opt for other options, but “best” is difficult to quantify. What are you looking for? What do you want to achieve? I understand how to attach a strap to a tree after studying it. I understand how to prepare the ends of the hammock with rope and hooks. I wonder as to the ways of fastening the strap to the hammock with a carabiner or rope. I weigh over 200lbs -if that is the weight conscious you refer. I suppose if I were to choose, I would like a method which is both quick and strong? I should have clarified: by “weight conscious” I meant how heavy or lightweight you want your suspension system. Some people “car camp” and don’t care how heavy something might be, or the weight doesn’t matter, whereas others are gram counters, trying to reduce how much is in their backpack. In either case, you want to make sure there is no weak link in the system: all components should be rated to the weight capacity you need. The Dutch Clips on this page are sufficiently strong and are very quick for getting a webbing strap connected around a tree. I think your question refers to the missing link between the hammock and the webbing, correct? One of the simplest methods is to use webbing with a built-in daisy chain, such as the Kammok Python Strap or the ENO Atlas Strap. With a climbing carabiner, you can clip the hammock to the strap at points along the strap. 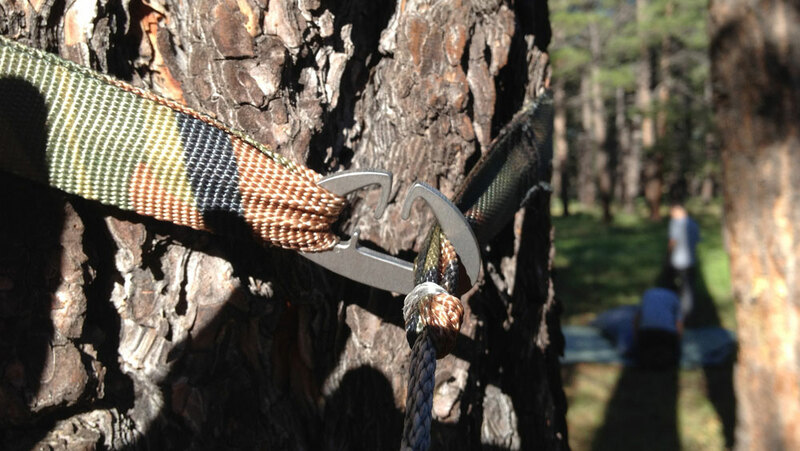 With just a strap, you could tie a Marlinspike hitch anywhere along the strap using a toggle. No extra hardware needed, simply loop the hammock’s end loop over the knot on the hitch. You could also put two descender rings on the hammock side, attached to the loop via a Lark’s head knot. Thread the strap through the rings to provide an adjustment point and then tie a slippery half hitch to secure. I’ve illustrated a few of these methods in my book.